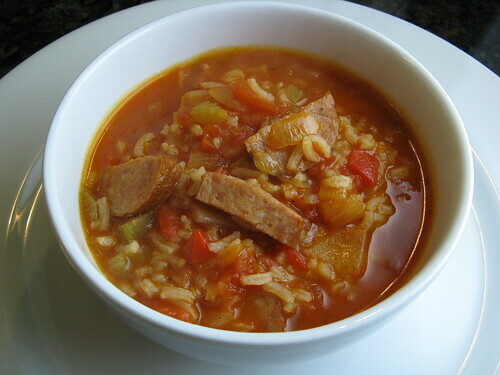 This soup came about because we had half of a smoked sausage link leftover from another meal & Matt suggested a try making a sausage & rice soup. I wanted to play on the smoky flavor of the sausage so decided my main spice would be smoked paprika. Roasted red peppers added another layer of flavor. And finally a touch of cayenne for a pleasant bit of heat. For sometime I just made up as I went along I was really happy with this finished soup. The flavors just seemed to come together perfectly & it had enough body to be a very satisfying main course with just a bit of crusty bread. In a medium soup pot heat the olive oil over medium-high heat. Add the onion & celery & cook until the onion is translucent. Add the sausage & allow to brown slightly. Stir in the paprika, marjoram, cayenne and a little salt & pepper. Next add the peppers & tomatoes including the liquid from the tomatoes. Break up the tomatoes with your spoon or squeeze in your hands are adding. Add the broth & bring to a boil. Stir in the rice, cover & reduce the heat to simmer. Let simmer until the rice is cooked about 30 minutes. Check seasoning & add salt, pepper & cayenne as needed. This soup looks very soothing right now. I have a cold, can you fedex me some please? Three cheers for smoked paprika...this soup rocks! Lately I seem to want to make everything I see on your blog. I just discovered some sausage in the freezer and was wondering what I should do with it. i love how you're just able to toss something so fabulous together. bravo. Definitely feeling this soup. I'm liking the smoked paprika and cayenne. These are some of my favorite things! This sounds amazing. Definitely one that will warm you up! Lovely! Rice in soups is so comforting. Your recipes are so good! Thanks! I used homemade chicken broth from smoked chicken and that really gave it a good Smokey taste I just had regular paprika but the Smoky Taste of the homemade broth was amazing with all the other yummy ingredients. thank you. It was a cold day here and I needed your soup.